The only current offering from EAT Restaurant Partners located in the Southside is Wild Ginger, a Pan-Asian restaurant with an extensive wine list, creative sushi, and a wide array of Asian inspired dishes. But unless you live in deep in the James River area of Midlothian you probably don't even know it exists. That's because this little place is tucked away in a small shopping center located quite a ways down Robious Road near 288. In case you don't know, EAT Restaurant Partners operate a few well known restaurants in Richmond, specifically Osaka Sushi and Steak, The Blue Goat (also reviewed on this blog), and most recently Fat Dragon. My guess is Wild Ginger is probably the least well known of the four, but that doesn't mean that if you live in the area you shouldn't get to know it. We decided to go to Wild Ginger for our January Restaurant Club, not having been anywhere on Southside in a while and wanting to check out something a little more ethnic than our most recent outings. Pulling up I caught glimpses of the warm yellow glow of the bar and the electric blue of the sushi area. I could see that for a spectacularly warm Tuesday night in February (yay for 75 degrees in winter!) several patrons were enjoying drinks at the bar and that the restaurant was fairly busy (I guess more people know about it than I think!). Bar area accented by fancy yellow lighting. Upon entering you can see that the bar is tucked away on its own, allowing the main dining area to stay quiet and peaceful. The bar area itself is quite attractive. The bar and shelves are internally lit with deep yellow lights and there is a nice large screen TV adorning the back wall. A lovely glass display of wine bottles helps separate the bar from the dining room. The sushi chef area also has its own decorative lighting thanks to a very cool and serene water installation that continuously bubbles calmly. Pretty much everything else in the restaurant besides these two colorful areas is a darker hue, creating an inviting and comfortable feeling and allowing the lighting features to provide a warm glow. Inviting dining room and wine display. After being seated we were greeted quickly by our waiter as we perused the wine menu. The wine list is extensive, but the cheapest options are $7 and the majority come with a fairly hefty price tag (and on top of those they still have a reserve wine list that you can request!). So, not the best place for a cheap drink, but I splurged a little and had the Lapis Luna Merlot which was excellent. The beer list is not nearly as vast but it did include some decent offerings. As far as the dinner menu goes, that is more along the lines of the wine list. There are several interesting sounding appetizers, like Sunshine Shrimp and Grilled Lamb Lollipops. For your entree you have the choice of going for a variety of fried rice or noodle options, steaks, Asian inspired meet and seafood dishes, or sushi. I was highly tempted to try one of the main entrees, especially the Shiitake Scallops or Saffron Shrimp, but since these were more like the types of dishes we had been getting at Restaurant Club recently I ended up opting for sushi. Now, I like sushi, but by no means am I a sushi connoisseur (I usually get eel and shrimp tempura, which is probably totally lame I am sure). So, to stay along those lines I ordered the Two88 Roll (cute right?) which is shrimp tempura topped with avocado and spicy blue crab with eel sauce and black sesame, and the traditional Eel Roll (ah I love how adventurous I am!). The Eel Roll was great, hard to mess that one up I think, and the Two88 Roll was beautifully displayed. The way the avocado was layered on top was gorgeous. It tasted very good as well, though I felt it had almost a minty flavor on top which threw me off a little. Eel and Two88 Rolls ... so pretty. My friends opted for the edamame, the Bogey's Roll, the Spider Roll, the Chesapeake Roll, the Wild Ginger Fried Rice, and the Pad Thai. Everyone liked their food, and having tasted a bit of each I particularly enjoyed the Pad Thai and the Chesapeake Roll (soft shell crab, avocado, spicy tuna and cucumber wrapped with soy paper and finished off with spicy aioli and eel sauce). The soy paper on the roll provided an interesting twist to the sushi, and my friend said that the Pad Thai was fancier than what she normally had, but I thought it was delicious. If I went back to Wild Ginger again I would probably get those two dishes for my meal. Chesapeake Roll ... I would get this next time! For dessert the other ladies chose the molten lava cake and the chocolate peanut butter pie. The dessert menu changes often so always be sure to ask your waiter about it. The pie was good, but I am not much in to peanut butter, and the cake was excellent but be aware that the melted center is dark chocolate. During the dessert course we ended up having a lovely discussion about whether we preferred splurging on dessert or wine when dining out. Just so you know, I am decidedly in the wine court! We all enjoyed our experience at Wild Ginger. The restaurant provides a casual yet calm atmosphere, our waiter was great, gladly answering our questions and attending to us well throughout the evening (even when one of the girls accidentally shot an edamame bean at him! ), and the food is fresh and interesting. At the end of the evening the checks totaled around $30 a piece, which is really not bad for sushi and wine ... or dessert (if that is your preference). 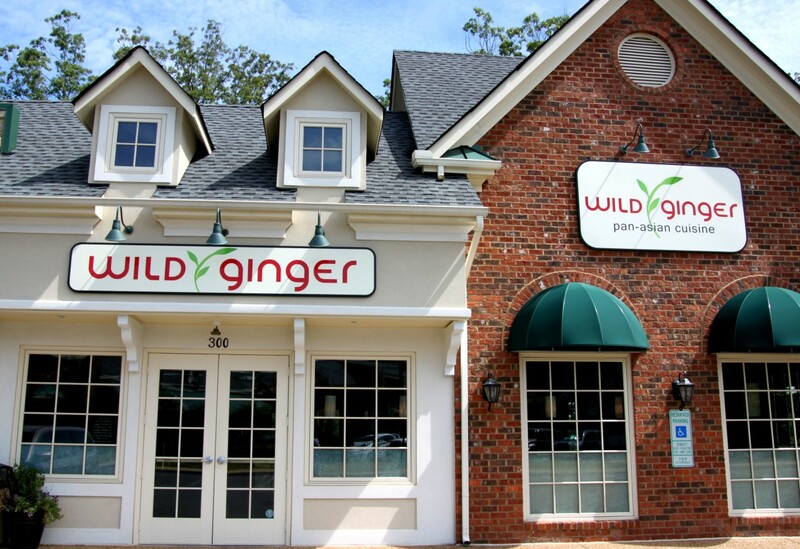 I really only found one problem with Wild Ginger: the location. Even for someone who lives in Southside I feel this place is a little far off the beaten path. If you live in the area it is a great place to have so close by, but I can't say I would drive past several other sushi restaurants just to go to there. So for those of you who are in the Robious/Huguenot/James River area and are in the mood for some good sushi or a refreshing take on Asian cuisine, I would recommend you give Wild Ginger a try. As for everyone else, let's hope EAT Restaurant Partners decides to open a restaurant that's a little more accessible for the rest of Southside! I actually found the inside to be a little loud during dinner. As the place cleared out some, the longer we were there, then it was a little easier to hear everyone. This blog started as part of our Restaurant Club, where a group of friends tried a new restaurant once a month together. Well, as most blogs do, ours fell apart, but I have decided to take it over on my own and expand it to all of my dining out experiences. I am a twenty-something woman born and raised in Richmond, and I love eating out, especially with good friends. I hope you enjoy. P.S. The actual Restaurant Club is still going strong! 5 Stars = Amazing! You must go there now! 4 Stars = Definately stop in some time. 3 Stars = Worth a try if you are in the area. 2 Stars = Not really worth it unless you are starving. 1 Star = Please do not go here...ever!